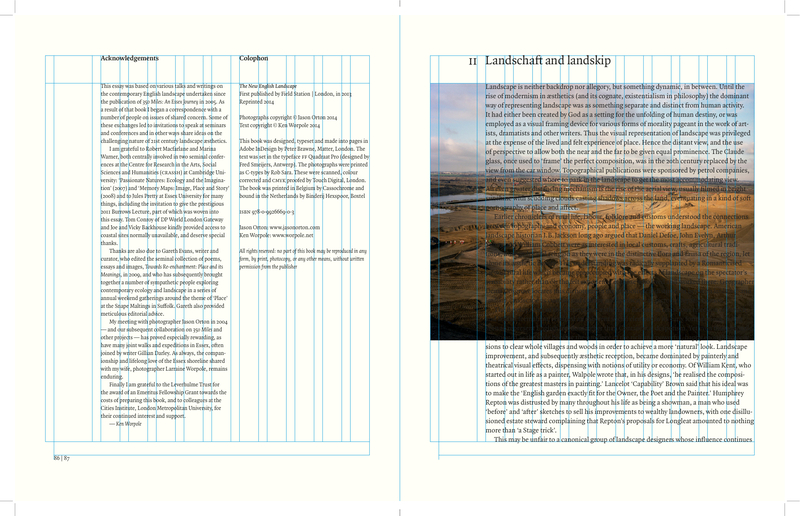 The grid, invisible in the book but revealed here, shows text in two columns and one, the placing of headings and page numbers as well as the positioning of all photographs. In response to our last post, What is seen and what is said, in which the relationship between writers and photographers was discussed, Peter Brawne, who designed The New English Landscape, describes how we all worked together, and in doing so raises some timely questions about the role of design, which we are very happy to publish here. His contribution comes just as the second edition of The New English Landscape is published, the success of the first edition owing much to the strength of the design and the impact this had on booksellers, reviewers and readers alike. ‘Photographs’, ‘text’ and ‘design’ are all (or become) things. These words are nouns and the coming together of Jason’s photographs and Ken’s text in the form of the book, The New English Landscape, makes of them real objects out in the world. But design is also, and more interestingly, a verb. It describes the iterative process, albeit invisible to the reader, of originating and developing an object, in this case a book. And Ken hints at this. For ‘the balance of power’ during the making of the book was as much a matter of negotiation between writer and photographer as it was one of a considerable amount of to’ing and fro’ing between Ken, Jason and myself, the designer of the book. This would happen at meetings here in Kentish Town when the three of us would get together and look at and discuss print-outs showing text in different fonts; layouts with pictures this, that or another size; and much poring over colour swatches to choose just the right shade of green for the cover and section divider pages. More frequently, I’d send emails highlighting specific things to look at within PDF attachments: third, fourth or fifth lot of text corrections; chapter heads in one weight or another; a different treatment for the Contents page; a new picture added to the overall sequence, and so on. And, though, as John Berger is quoted as saying ‘…photos are a reminder of everything which is beyond the power of words … and the words recall what can never be made visible in any photographs’, both remain abstract, theoretical, locked inside a computer until the practice and processes of design and printing make both tangible: books, nouns. It’s interesting that Berger is highlighted. 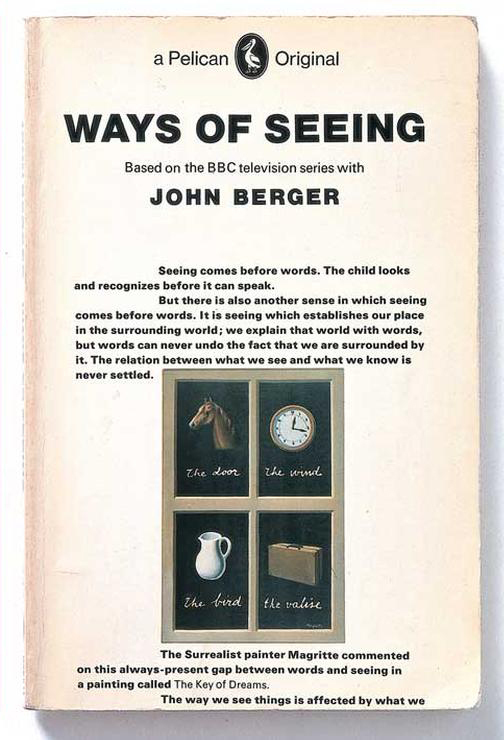 As has often been noted, his hugely popular book Ways of Seeing is actually credited as the work of a team: Sven Bloomberg, collage artist; Michael Dibb, BBC producer (the book started life as a TV series); Chris Fox, a ‘critical’ friend; Richard Hollis, graphic designer as well as the writer John Berger himself. All were given equal credit in the book (if not the cover) to the extent that for the first printing Berger insisted that royalties be split equally five ways. Not only this, but according to Hollis, their roles were vaguely enough defined for there to be room for each collaborator to move across, or stray away from their own disciplines (see: https://www.typotheque.com/articles/ways of seeing book review). I felt similar things happened during the course of making The New English Landscape, and as such, it created a virtuous circle, a symbiosis of means and ends. This pattern of working is different to the much touted idea of the ‘designer as author’ (or even ‘designer as artist’) where, in so many cases, the designer colonises the work of others — writer, photographer, illustrator — using their output as base materials to do with what s/he wants. The usually insensitive results can be seen in the art, architecture, design or photography sections of any bookshop: garish soap powder boxes masquerading as books. Of course you cannot not design, but it doesn’t therefore follow that design should adopt an intrusive, shouty, look-at-me posture. The books by Berger et al were also interesting to me from the point of view of designing The New English Landscape. They highlight the possibilities of giving equal weight to pictures and text — pictures not used to illustrate the words; words not used merely as explanatory captions to pictures. Ways of Seeing acts as an exemplar of one particular way of doing this. What it does so efficiently, is quietly but unmistakably articulate a polemic by means of very exact juxtapositions of words and pictures. This creates a ‘third effect’: the power of the message results from pictures and text (but it could just as easily be two or more other elements) put together in close proximity asking to be read and viewed in relationship to each other. Without one or the other of these elements, the ‘effect’ wouldn’t work. They need and mutually reinforce each other. Hollis has acknowledged that he was influenced here by Chris Marker’s book Commentaires. Marker was a film-maker and in that book there are numerous stills from his films set within the text. Hollis, in an interview with Christopher Wilson, writer and designer, says, ‘As you read you knew exactly what was being talked about. It was a substitute for description: instead of talking about something, you show the objective visual evidence. That’s how I wanted to do Ways of Seeing, rather than having images by the side or text followed by a page of images.’ (see: http://www.eyemagazine.com/feature/article/reputations-richard-hollis). Relevant here too, at least from a design point of view, is Marshall McLuhan’s book from 1967, The Medium is the Massage. Though the message of the book is open to question (McLuhan is alternately revered and vilified) much of it is spookily prescient. But what intrigues in this context is the inseparable links between words and images within a mass circulation paperback. Though all in black and white, pages, or more accurately double page spreads, are treated almost as a succession of posters: huge bled-off type combines with a photo of small figures; text changes from small to large as you read down the page giving the impression of it coming out towards you; a massively enlarged photo of a fingertip supporting a microchip sits on a black background with smaller white type on two lines ranged right; a diagram on one page is followed by a cartoon ‘BANG!’ It has been called ‘the first book for the television age’ (see: http://www.printmag.com/imprint/quentin-fiores-medium-and-massage/) and as such, it’s odd that so few books have followed in its pioneering footsteps. This was largely the work of Quentin Fiore, the book’s designer. Indeed, though the book is credited to McLuhan it actually came about through the instigation of Fiore, and, like Ways of Seeing, credit is also given to it’s ‘producer’, Jerome Agel. Though many of these strategies wouldn’t work for The New English Landscape and it doesn’t follow these models, this desire to give equal weight to pictures and text as well as some of Hollis’s other values — and those of similarly thoughtful designers — specifically a refusal to adhere to stylistic dogmatisms, still permeates the book. Serif or sans serif fonts? I presented both before we settled on just one font but in different weights, Quadraat, designed by Fred Smeijers; adherence to one weight and size of text, or many? I used what seemed right in each circumstance; rigorous or flexible grid? Text pages have a wider left hand margin than picture pages as these already have generous amounts of white space top and bottom. Where Ways of Seeing is didactic and pedagogic (I first saw it as the TV series while on an art foundation course), Ken and Jason’s book is discursive, ruminative, open, and though there is much that is specific and particular, allusive too. The text is presented straight and with accessibility in mind. I’ve made no attempt to ‘interpret’ or ‘reinterpret’ it. To begin with, there was an assumption that text would be set justified (an even margin left and right). I argued for it to be ranged left (an even margin left, a ragged one right) as this felt more in keeping with what the text actually says (and does: it’s essayistic), it makes it feel less doctrinaire and provides a useful contrast to the even margins created by the squared-up photographs. In the end we went with this and I hope the initial anxieties that this might give the book a frivolous appearance have disappeared. The other critical and too often overlooked aspect of a book is its printing and production. All the work that has been put into it to date can, in these final stages, be so easily ruined or wonderfully enhanced by what follows. I had seen well-made books produced by the Belgian printer Cassochrome and we were fortunate in being able to work with them. Laurence Soens came and visited me with samples of paper, colour guides and previous examples of work they had produced. So when the time came to hand over final artwork the groundwork for a productive relationship had already been laid. Their help and advice on paper and card was invaluable and their attention to the details of colour matching the original colour photographs with process inks (cyan, yellow, magenta and black) was exemplary. They also arranged for the binding, a special process called Otabind, to be done by the firm Hexspoor in the Netherlands. This method ensures that when turning pages, a book lies open without the need for pinioning it down (see: https://hyphenpress.co.uk/journal/article/bookbinding_survey). A small detail perhaps, but an important one. And now, as the first print run has sold out, the book has been reprinted as before but with a few plaudits selected for the back cover. It’s due to arrive any day now and I’m looking forward to seeing it once again.